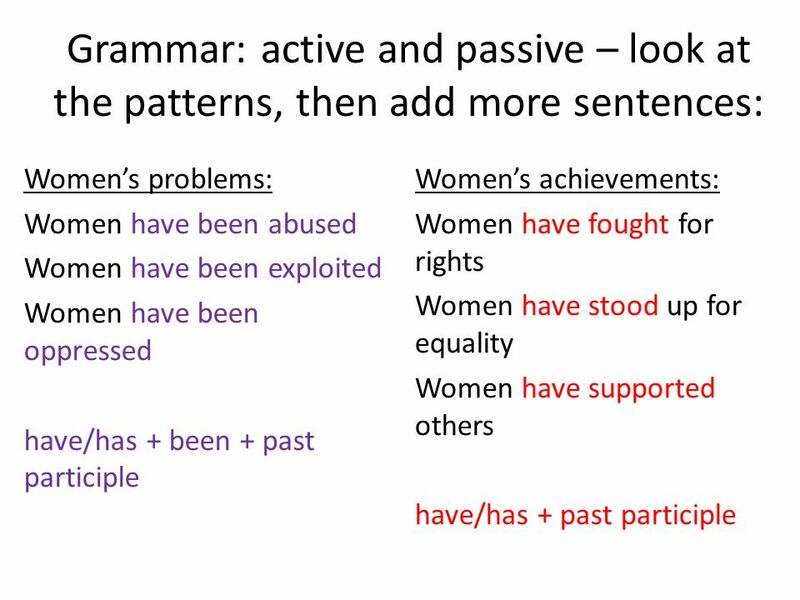 Women NEW INTERNATIONALIST EASIER ENGLISH Intermediate READY LESSON. 3 Who is this? 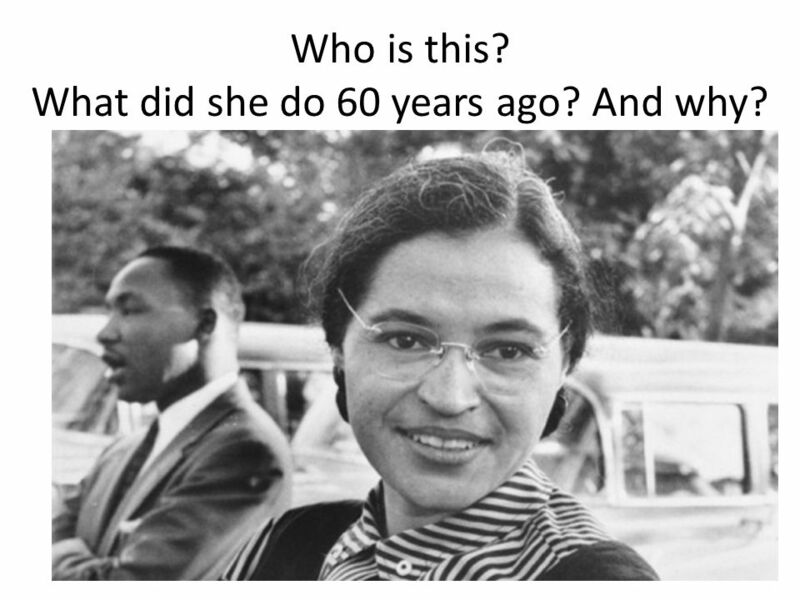 What did she do 60 years ago? And why? 7 Dictagloss 1)How do you think the article will continue? – discuss in pairs. 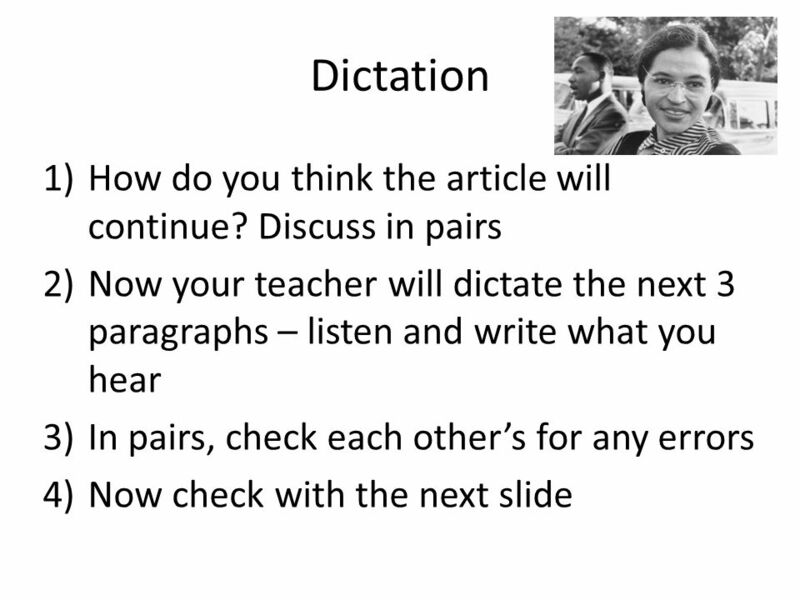 2) Your teacher will now read the next two paragraphs at normal speed, twice. Make notes of the key words. 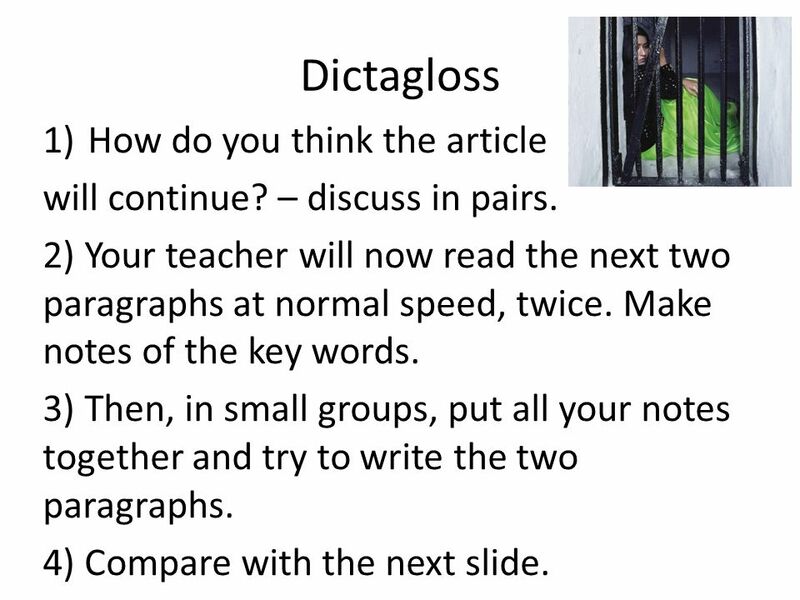 3) Then, in small groups, put all your notes together and try to write the two paragraphs. 4) Compare with the next slide. 8 Resistance is growing. Indigenous communities are demonstrating against environmental destruction in Canada. Migrants are protesting about not having freedom at Yarl's Wood detention centre in Britain. Bloggers are speaking about mental health issues. Groups are making the Indian government talk about sexual violence. Every day, women are fighting against oppression. 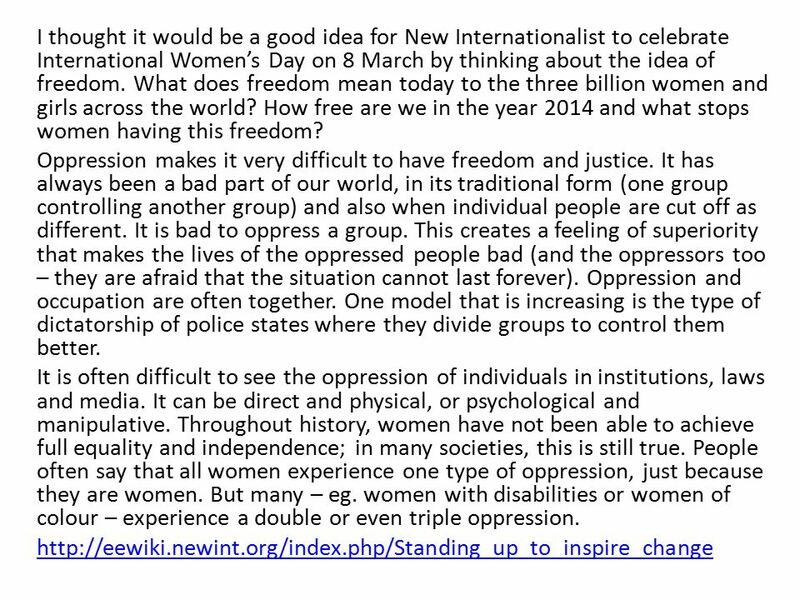 The theme of this year’s International Women’s Day is ‘Inspiring change’. 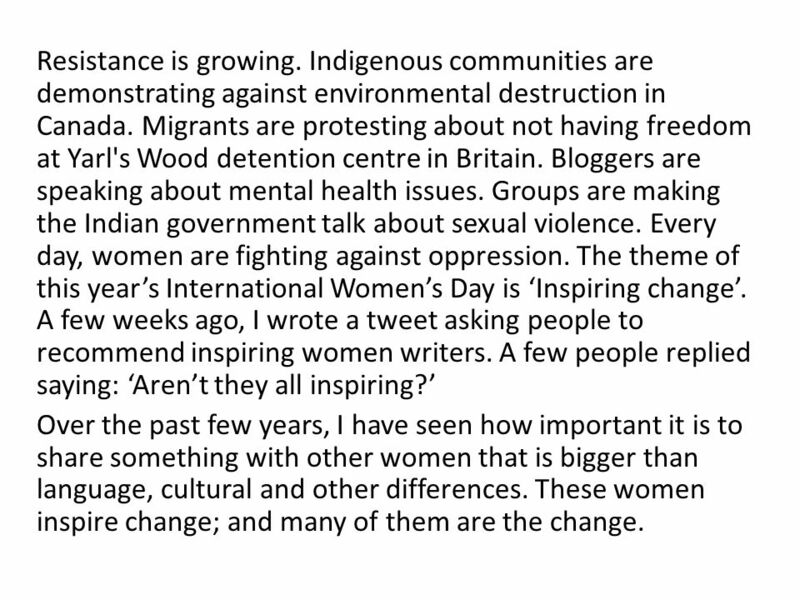 A few weeks ago, I wrote a tweet asking people to recommend inspiring women writers. A few people replied saying: ‘Aren’t they all inspiring?’ Over the past few years, I have seen how important it is to share something with other women that is bigger than language, cultural and other differences. These women inspire change; and many of them are the change. 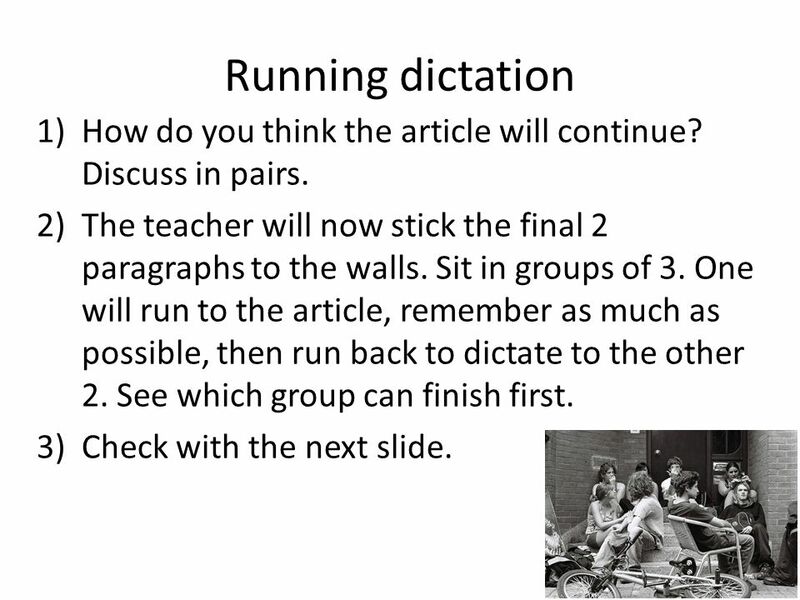 9 Running dictation 1)How do you think the article will continue? Discuss in pairs. 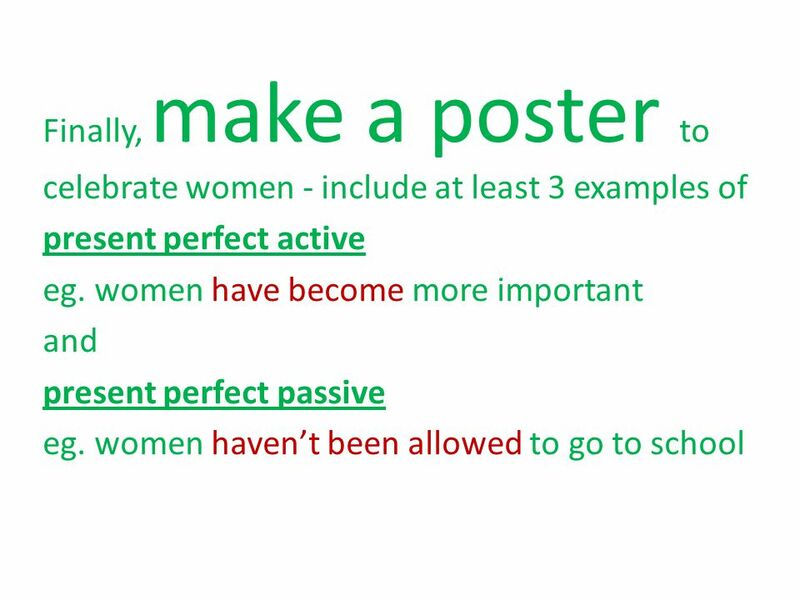 2)The teacher will now stick the final 2 paragraphs to the walls. Sit in groups of 3. One will run to the article, remember as much as possible, then run back to dictate to the other 2. See which group can finish first. 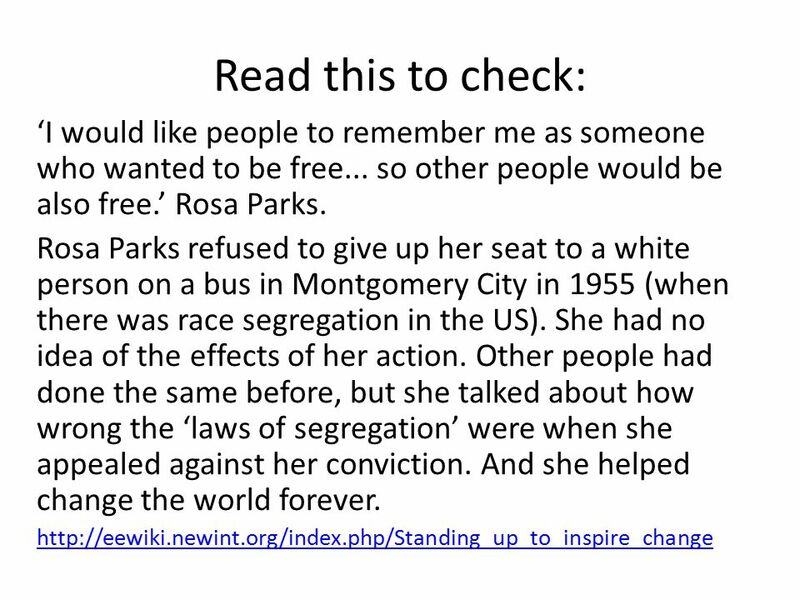 3)Check with the next slide. 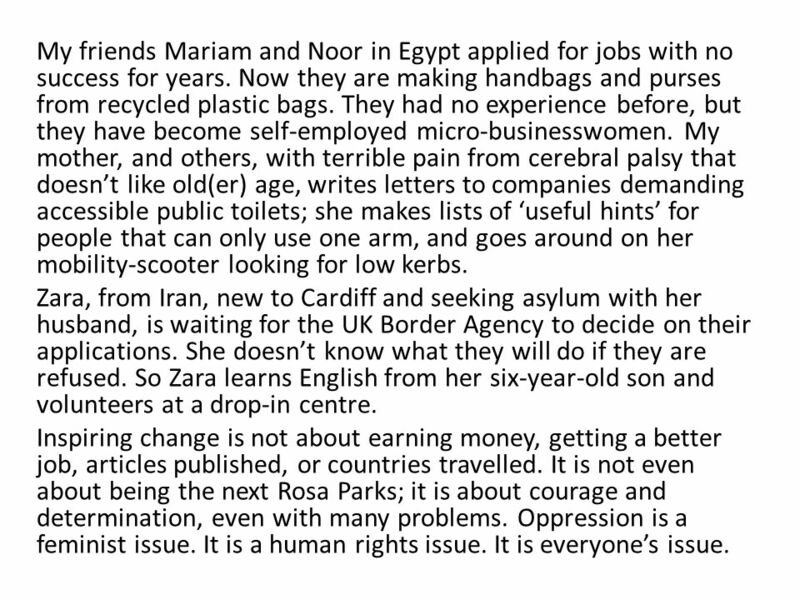 10 My friends Mariam and Noor in Egypt applied for jobs with no success for years. Now they are making handbags and purses from recycled plastic bags. They had no experience before, but they have become self-employed micro-businesswomen. My mother, and others, with terrible pain from cerebral palsy that doesn’t like old(er) age, writes letters to companies demanding accessible public toilets; she makes lists of ‘useful hints’ for people that can only use one arm, and goes around on her mobility-scooter looking for low kerbs. Zara, from Iran, new to Cardiff and seeking asylum with her husband, is waiting for the UK Border Agency to decide on their applications. She doesn’t know what they will do if they are refused. So Zara learns English from her six-year-old son and volunteers at a drop-in centre. Inspiring change is not about earning money, getting a better job, articles published, or countries travelled. It is not even about being the next Rosa Parks; it is about courage and determination, even with many problems. Oppression is a feminist issue. It is a human rights issue. It is everyone’s issue. 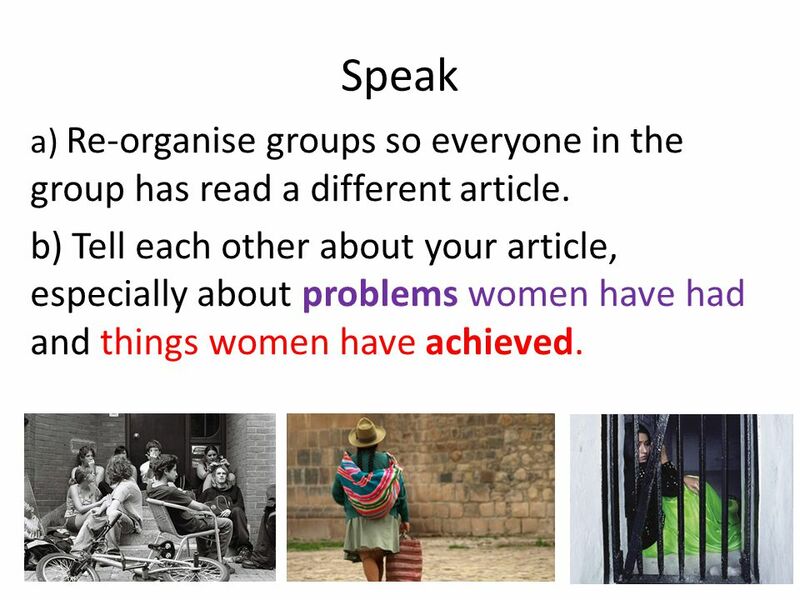 13 Speak a) Re-organise groups so everyone in the group has read a different article. 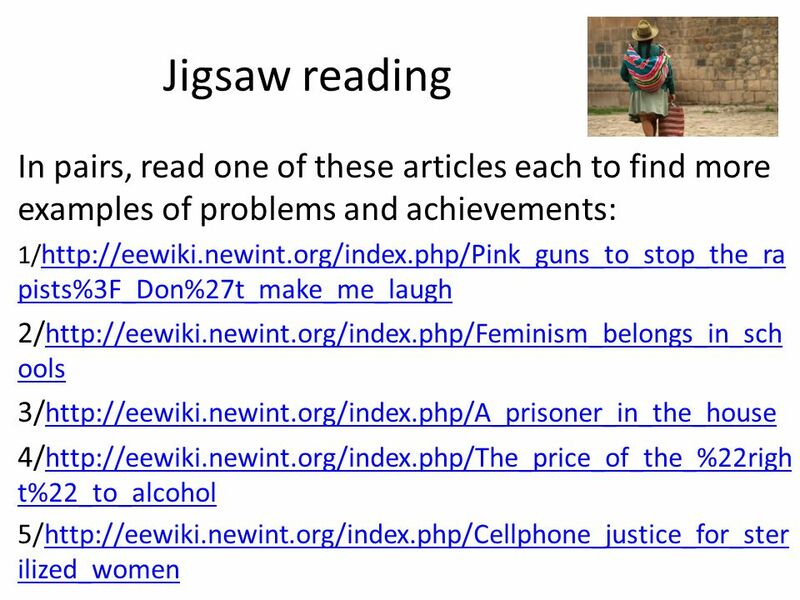 b) Tell each other about your article, especially about problems women have had and things women have achieved. 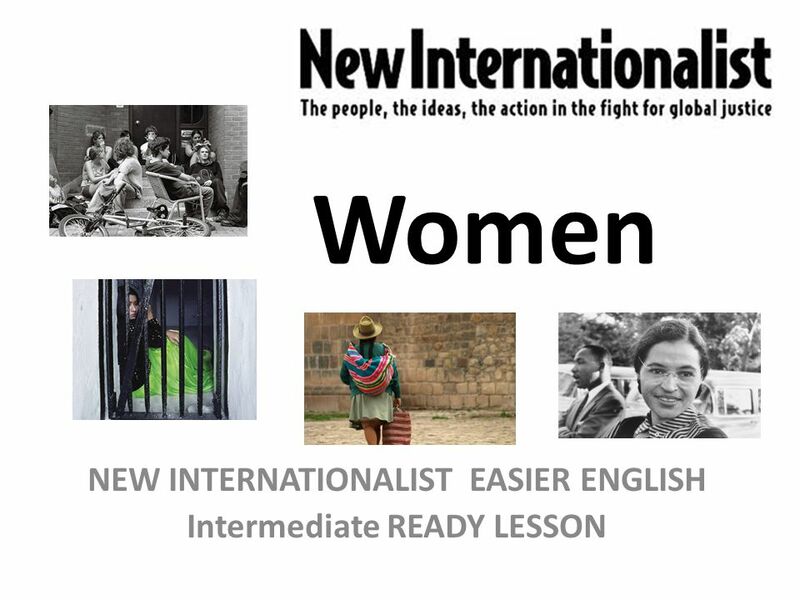 Download ppt "Women NEW INTERNATIONALIST EASIER ENGLISH Intermediate READY LESSON." 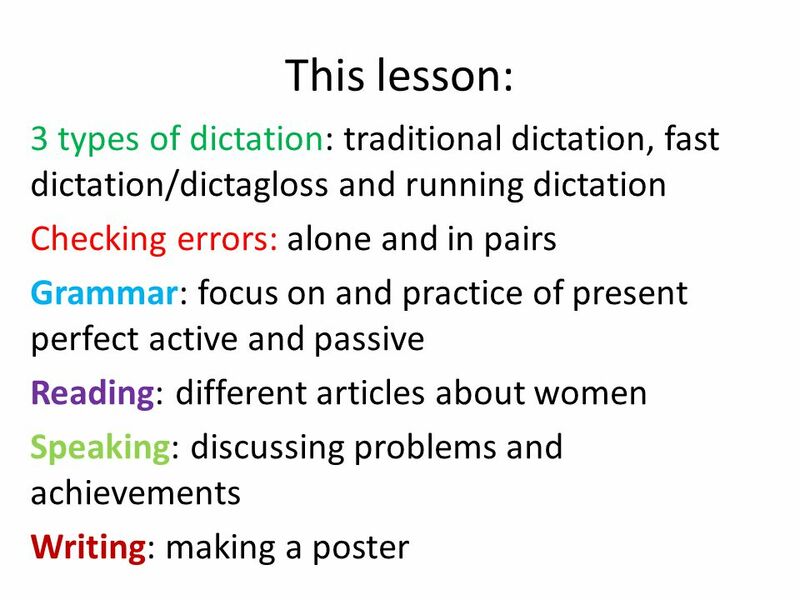 Reading Strategies Specific Objectives: Upon completion of these lessons the students will be able to: Identify the specific reading strategies that they. We are able Developing reading comprehension New Internationalist Easier English Ready Lesson: Intermediate / Upper Intermediate. People who change the world New Internationalist Easier English Intermediate Ready Lesson. “Ask the Experts” Theme 3 Lesson 14 Day 3. Question of the Day What do you talk about with your friends? My friends and I like to talk about ______________. Charities and NGOs NEW INTERNATIONALIST EASIER ENGLISH UPPER INTERMEDIATE READY LESSON. Chapter 2 Preview Bellringer Key Ideas What Are Life Skills? Health for the world? New Internationalist Easier English Ready Upper-Intermediate Lesson.